If you are looking for a matte grey Viper, be quick, SRT will only make 50 with the Anodized Carbon special edition package, which goes on sale in January. We like SRT's paint shop since they came up with the Striking Red Viper, but in case you want to keep a low profile, grey might be a better choice. 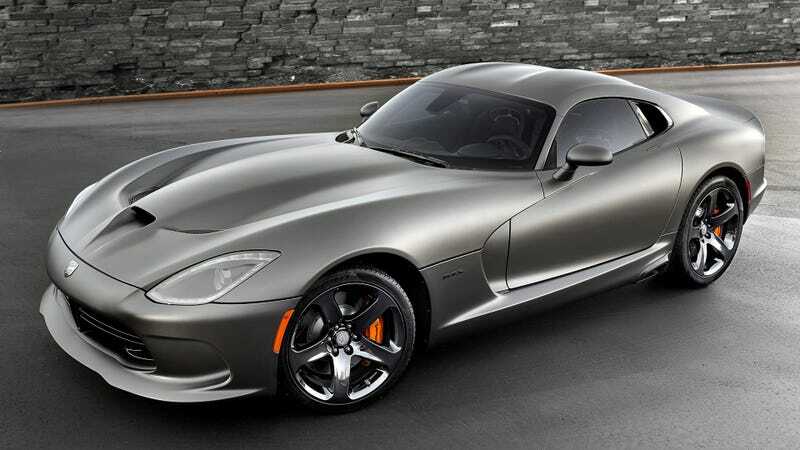 The new metallic finish adds depth while the dark matte color amplifies the Viper's sinister quality. It also probably makes it harder to keep clean. Apart from the paint, the package also includes black chrome five-spoke "Rattler" wheels, a gloss Black GTS badge, satin black exhaust bezel, anodized carbon fuel filler door, orange brake calipers, carbon fiber brake ducts and rear applique. Inside, you get Alcantara-wrapped headliner, door bolsters and knee blockers; orange accent stitching on the Nappa leather wrapped door trim, center console and instrument panel and on the leather and Alcantara seats. Orange accents are also added to the door panel and instrument panel. Carbon fiber accents are added throughout the center stack, door panels and steering wheel, and there's an exclusive carbon GTS badge on the dashboard. Don't forget, there's only 50.